The Gonzo’s Quest slot machine has been available in Kroon casino for a long time now and it has become a tremendously popular game since it first launched. That is partly because of the fact that this game offers some unique features, e.g. in terms of the design of the game’s reels. 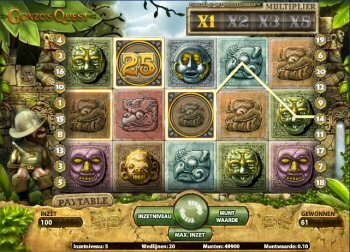 The game offers several features that give players a chance to earn extra high profits. Before pressing the start button, a player can customise a few settings, e.g. the coin value. If you are looking for a new slot machine experience, the Gonzo’s Quest slot machine is definitely recommended. As soon as you hit the start button, you will be surprised. The symbols are shaped like squares and when the first spin starts, the symbols will fall down your screen like blocks, instead of spinning on reels. The game features five reels of square symbols and three rows, so the game has a total of twenty win lines. The features make or break a game, as is the case with the Gonzo’s Quest slot machine. One of this game’s remarkable features is its avalanche function. This function becomes active when a winning combination appears. Once it does, the blocks that made up the winning combination will explode and be replaced by new blocks. This means a player stands to win more and more money, especially because each avalanche increases the multiplier. The multiplier starts at one with your first avalanche. It then proceeds to two and reaches three when you get three avalanches. The highest multiplier you can get with an avalanche of winning combinations in the base game is five. The multipliers can get a lot higher during the free falls, however, because the maximum there is fifteen. That is truly special, of course, because you will know that you won a lot of money in that round. Free falls can be won on the Gonzo’s Quest slot machine when the game shows three free fall symbols. There is also a wild symbol available, which is shaped like a square with a question mark in it. The Gonzo’s Quest slot machine is a unique game that is a lot of fun to play and gives players a surprisingly large number of ways to win money. Players who have heard of this game before but never tried it themselves can start playing this slot machine at any time and discover everything it has to offer. Players can play for free without a player account. Playing for money does require an account, for example at Kroon casino.